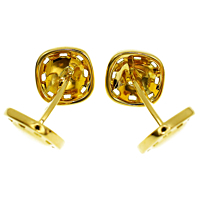 A vintage pair of yellow gold Hermes cufflinks in a soft square shape with rounded edges. Featuring a high polished 18k yellow gold finish and tiny square cutout detail. The posterior link is a matching soft square shape, also in solid 18kt yellow gold.